Awwwweeeee... look what Edward and Inez Davenport sent. Thank you sweet kitty friends!!! You look awesome in your hats!! Happy Birthday! Queen of Floofy I love it! Indeed "The Queen of Floofy" - how sweet of your friends Ms Bean. cats are all about dignity and they wore HATS for you - the love is obvious. How sweet of Eddie and Inez Davenport! Your lessons in catiquette took quite nicely. I love it! Happy birthday Charlene from all of us. Peeps, Blue and Remy send you birthday mews and head bunts. 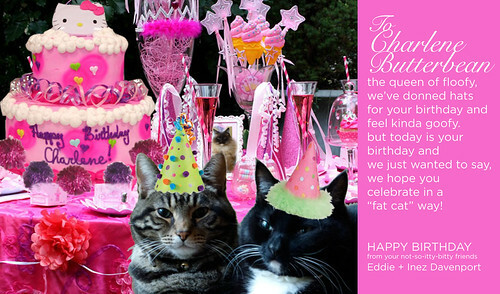 Awww-a great card from Eddie and Inez for a great lady! Happy Birthday, sweet Charlene! May you have every wish come true! What a cute card! And, Eddie and Inez look beautiful! Happy Birthday to you, sweet Butterbean! Enjoy the rest of your birthday, Charlene! How lovely of Inez and Edward! Wow! Oh wow what a great little card, thats good to hear!